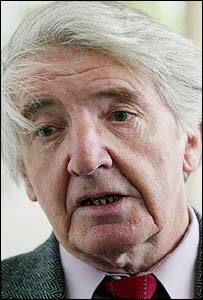 Veteran Labour MP Dennis Skinner is recovering after undergoing a double heart by-pass operation. Mr Skinner, who is 71, is understood to have had the surgery at the Royal Brompton Hospital, London, on Monday. A close friend said doctors had described it as "a great, great success". Some months ago Mr Skinner underwent treatment for a condition affecting his bladder. It is understood that the operation on Monday lasted more than three hours. Mr Skinner has been MP for Bolsover, in Derbyshire, since 1970. He describes himself as coming from "good working-class mining stock" and has always been on the left-wing of the Labour Party. He is a popular orator, but at times he has been a thorn in the side of successive Labour leaders, particularly recently on the issue of war on Iraq. A statement on his behalf said: "He has already voted against a war with Iraq five times and regrets that he will be unable to leave hospital to vote against the war this time." Mr Skinner supports Derby County football club and Derbyshire County Cricket Club. Soon after regaining consciousness after the operation he was discussing cricket with the nurses.